The Glam Rosie Diaper Bag Blue sports lustrous highlights and captivates the hearts of all fashion-conscious moms with its stylish design. 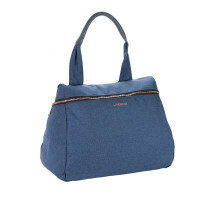 Product information "Glam Rosie Diaper Bag, Blue"
description & equipment The trendy Glam Rosie Bag sports lustrous highlights and captivates the hearts of all fashion-conscious moms with its stylish design and sparkling features. 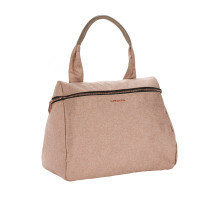 The stylish LASSIG diaper bag stands out thanks to its unusual trapezoid shape and handle and capture the imagination with dazzling details such as zippers and rosé gold Lassig lettering. The clever thing about this bag, however, is the additional adjustable strap with backpack feature so that you can wear the bag on your back. 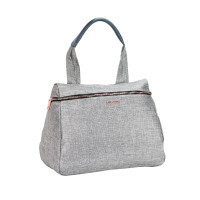 This multi-functional bag features four different wear and carry options in one: Handbag, shoulder bag, backpack and diaper bag, including a stroller attachment that you can use to take the pressure off your back and shoulders. It boasts a well organized interior with spacious compartments and accessories such as a water-repellent changing mat, insulated bottle holder, removable baby food jar compartment, integrated cell phone compartment, key finder and much more. 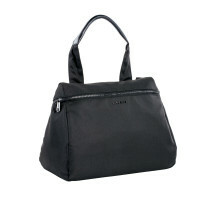 This makes the Rosie Bag an eye-catcher not only during, but particularly after, the diaper-changing years.